When you do something that takes a lot of work and exposes yourself to the world, it’s nice to know why you’re doing it. I’ve enjoyed reading blogs for a long time now, but I haven’t felt the need to create a blog until now. Should I create a blog because I like to write? That was not enough reason. Anyone who has has clicked around the site or subscribed to the newsletter knows that I do have plenty to say in the articles. My thinking was that a blog was essentially a tool for publishing articles and would offer very little improvement in content experience. I was fairly handy with HTML, so why bother? A friend of mine named Rob occasionally sends me an email ragging me for not updating my site. Just this week, Rob observed that the site had been kind of “static” lately. I misunderstood his remarks, probably because I had been updating the Clickfire webmaster directory regularly and had just finished writing what I thought was an intriguing review of Chitika eMinimalls advertising program for webmasters. I replied that I wasn’t aware of any server down time and it was probably a network issue. The site would be back up soon and Rob would then be able to read my Chitika review. It hit me that the frequency of web site updates has increased a whole lot since this site began in 1997. Visitors now expect more. My routine of working up content and slapping it into HTML has worked fine for years. Thanks to web log scripts like Matt Mullenweg’s WordPress which this site uses, updating became much easier. Yet, a quick and easy way to get content live without going into the code seemed appealing, but didn’t tip me over the edge into blogdom. Should I create a blog because of the success of many other webmaster blogs? I’m sure the thought crossed my mind. As a search engine marketer, when I see sites cranking out volumes of content that appear high in the Google rankings, I perk up. I had installed and customized a blog for a customer and oberved the SEO benefits that could be leveraged. Webmasters with expertise in their niche areas have turned sites into careers. I realized this when I saw one of the guy’s from PowerLine interviewed on national television during the Dan Rather Bush military record controversy. Such bloggers are doing what they enjoy for a living–now there’s a thought that stuck. Yet, I resisted throwing Clickfire into the blog band wagon. The tipping point came after listening to a few podcasts by Dave Taylor of Intuitive.com (he also runs AskDaveTaylor.com). Dave is an expert on business blogging. He says he’s “been involved with the Internet since 1980.” I became an Internet user in mid 1990’s. My personal journey through the Internet seems a little similar to his, a web designer/writer/web marketer seeking creative ways to communicate ideas via the web. A valuable point that I took away from Dave’s audio discussions was that web site owners–especially business web site owners–can utilize blogs to establish a dialogue with visitors. I receive almost daily correspondence from Clickfire visitors via email. 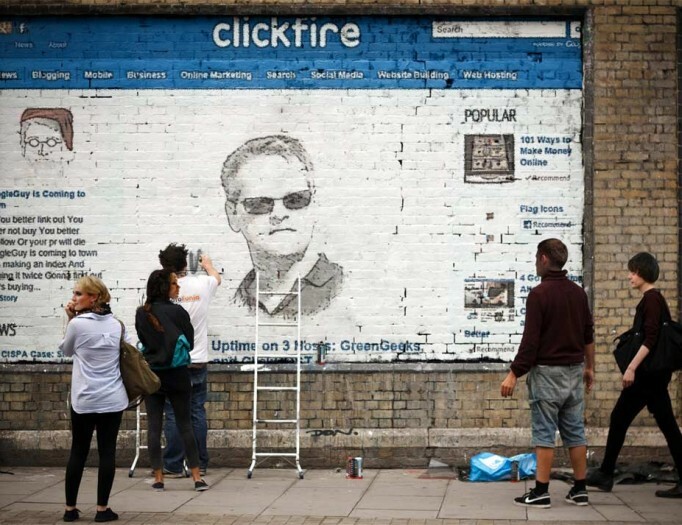 I enjoy hearing from visitors who have read the Clickfire Spark Webmaster Newsletter or just stumbled onto the site and found something helpful or irritating. But, email is no longer the content medium I prefer for most communications. I often think that the much of the correspondence I have privately could benefit many other visitors were it allowed to be posted in public. So, if I wanted interaction and communication with visitors, why not start an Internet discussion forum at Clickfire? As an evangelist of discussion forums and one who has learned and contributed frequently to forums, I wasn’t excited about putting time into the administrative tasks of managing and editing a forum. I want to communicate, not administrate. As many bloggers point out, they’d rather be writing content than coding a page for it. I also wanted solely to drive the direction of the content and discussion posted instead of letting it be community driven. There are plenty of worthy webmaster discussion forums out there like SitePoint Forums, which I enjoy reading and contributing to. The goal is to read and share viewpoints with other webmasters and visitors on specific blog topics. Hello World? Looks like we got a blog. Answered some good questions I had about what a blog was and how fun it would be to keep one of my own. Oh, and I don’t plan on ever stopping! and not commenting forever i decided todo my own blog but its not doing so well. BOO HOO IM LONELY!! YOUR SO CUTE!!! I’ve been thinking lately about how odd it was that I used the term “created” instead of “started” or “begain” or “installed” or something and I’ve come to the conclusion that in 2005 you “created” everything on the web – the content as well as the code on the static pages. It sounds strange now in the world of one-click WordPress installs and updates. We definitely don’t have to think about the building of the platform as much now, which is great because theoretically we should have more time to create content, right? Now the surplus time probably all goes to social media.